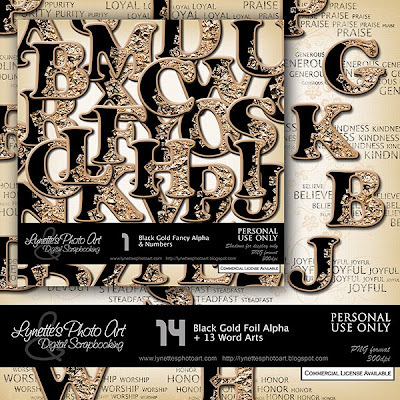 Black Gold Foil Alpha with Numbers & Word Art are elegant, beautifully detailed with tiny letters inside each letter of black and gold foil filled letters. All the word arts are approximately 6" and easily sized down - 13 of them! Click image to enlarge. Click the Buy It Now button below the preview to purchase from my PayPal Store for $1.99. For today's gift I have one of the word arts for you. Enjoy! Those letters are beautiful, TFS. Thank you! Your blog post will be advertised on the DigiFree Digital Scrapbooking Freebie search engine today (look for timestamp: 25 Jul [LA 07:00pm, NY 09:00pm] - 26 Jul [UK 02:00am, OZ 12:00pm] ). Thank you so much for this Freebie. I want to let you know that I posted a link to your blog in Creative Busy Hands Scrapbook Freebies Search List, under the Page 3 post on Jul. 26, 2009. Thanks again.